It’s a new year, and with it comes new challenges, trends and forecasts for the recruitment industry in 2019. When you consider that we’re living in a candidate-driven market and nearing full employment, where competition is strong, it’s important to have a solid brand reputation. Furthermore, in a time where candidates place equal importance on company culture and company values, as much as salary expectations, it’s vital to have a solid brand positioning. Today’s candidates want and seek transparency in a potential place of work—the company’s mission, its core values, its culture, people, and its commitment to social responsibility. They also want to know, if the recruitment process is successful, what its really like to work there—and they will do their due diligence to find out this information. Similar to consumers researching a product before purchasing, professionals are doing their research before applying for jobs. Whether searching career pages, reviews on Glassdoor or digging through company Facebook and Twitter accounts, candidates are eager to learn whatever they can about the experience of working at a potential new employer. While this new reality has presented some challenges for employers, it has also created a great opportunity. Research reveals that 75% of jobseekers consider an employer’s brand before even applying for a job. This means that organisations can do more to manage and promote their brand image, to attract the right talent. The companies that take the lead in managing their employer brand can ensure their company projects the right image—one that helps to draw in right-fit talent and build a workforce of individuals aligned with the company and its goals. Those taking it seriously are now employing ‘Employer Branding Specialists’ a new recruiting / marketing dedicated resource responsible for defining, maintaining, and promoting the company’s unique employer brand. 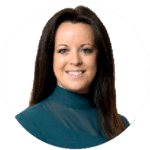 Its a new role emerging as the world of talent acquisition continues to evolve and more and more companies see value in defining their brand as a way to set themselves apart from the competition. What is an Employer Branding Specialist? Sitting between the traditional HR and marketing function, the Employer Branding Specialist, takes on the task of positioning the company as a great place to work and attracting potential hires. 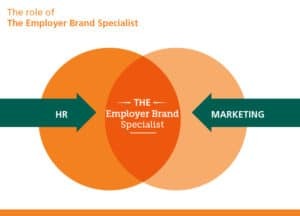 The Employer Branding Specialist(s) should act as the link between both HR and marketing and work together linking the skills and capabilities that each team to deliver to optimise the employer brand. Since every company is different, there is no ‘one size fits all’ job description for this role. Yet, it requires the job holder to be driven and creative, with good people skills and strategic planning above all. Developing a communications strategy that promotes the company as a great place to work and demonstrating this on all digital, social and internal platforms. These may include flexible working, free memberships and time-off for volunteering. Working alongside internal communications teams to develop messaging and content. Using employee ambassadors to extend your reach. Build candidate pipelines: Research shows that 90% of Irish candidates are interested in hearing about jobs, this is a prime opportunity to create a talent pool of prospective employees. Tracking engagement scores to increase following on social channels. Acting as a brand representative. Supporting end-to-end recruitment, through organising networking events. Using the right platforms to find the best candidates and breaking out of traditional recruiting methods. The value Employer Branding Specialists can bring to the recruitment process has been recently documented by Linkedin. In their study, 72% of recruiting leaders worldwide agreed that employer branding initiatives has a significant impact on hiring. Furthermore there’s ample evidence that a great employer brand makes it easier to recruit and it also impacts the business’ bottom line with an average reduction of 50% in the cost per hire, according to the survey. This forward-thinking approach has never been more important to position companies as a great place to work, in order to attract and retain the best candidates in the market. As more companies learn about its benefits, the industry will continue to respond to this trend. Which is why it’s wise to get on board now, and make sure your company is leading the charge, rather than following the trend.